More and more frameworks logs with the SLF4J framework. Many applications must relate to several different logging frameworks. This tutorial shows how one logger framework can handle log messages from other logging frameworks with SLF4J as the central part. 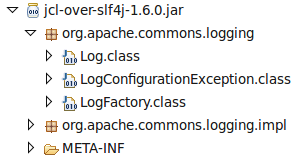 Log4J integrates well with JCL, but can’t handle log messages from SLF4J. This forces the use of SLF4J to connect the different loggers together. The Simple Logging Facade for Java or (SLF4J) serves as a simple facade or abstraction for various logging frameworks, e.g. java.util.logging, log4j and logback, allowing the end user to plug in the desired logging framework at deployment time. In addition to the extra flexibility, the API also contains a nice feature with support for arguments. The difference is that SLF4J doesn’t merge the dynamic and static data into a new string in the debug method, but sends the dynamic part(s) as argument(s). If the logger is configured to only log messages with info level or higher, the debug message above gets discarded without any string processing and without the need for an extra if sentence for performance reasons. For information about SLF4J and its alternatives on a high level, Bruce Snyder has written a good post here. The first option is to bind the SLF4J logger against Log4J. It works nice and enables management of JCL and SLF4J log messages from the Log4J configuration. In my case with the log4j.properties file. With the second solution, SLF4J’s binder framework will receive all the log messages. You can only bind against one backend logging framework. With no binding framework on the classpath, the silent logger (NOP) will be used by default. The preferred backend logging framework with SLF4J is Logback. Logbac is written by the same people who have written SLF4J. It natively implements the SLF4J API. A nice feature with Logback is that you can see which jar file that contains a class in the stacktrace. And if the jar file contains an Implemented-Version property in the /META-INF/MANIFEST.MF file, then you can see the version number to the right for the jar file name. You can find more reasons to upgrade from Log4J to Logback on their site here. With SLF4J’s JCL bridge implementation, you can program against the JCL API without adding the JCL jar file, since the bridge implementation contains the necessary classes to route the log messages to the SLF4J’s backend implementation. SLF4J is the new common logging API for new open-source projects. With its facade pattern implementation, it’s a very flexible framework that let you easily integrate different logging frameworks used by the application’s dependencies. It’s also modular by nature with a loose coupling between the SLF4J API and the backend logger framework. In addition to the modularity, I like the enhanced stacktrace that’s printed with the configuration illustrated in the second scenario without changing a single line of code! If you in the future wants to standardize logging with SLF4J, then you can use this migrator that’s bundled with the SLF4J distribution and migrate your log4j.properties file to a logback.xml file with this online translator. Even though aspect technologies are very powerful. Especially to address cross-cutting concerns like transactions, it shouldn’t be used everywhere it’s possible. The first part of this post consists of a simple example that uses AspectJ to return an unexpected value. The last part is about where aspects fits and where you should consider to avoid it. This applies to some degree to aspect technologies too. Since it can change the behaviour of an application at compilation, startup or at runtime. Even without leaving a trace in the source code. To demonstrate an unexpected result from a method, I have created a StringAspect with AspectJ that returns the opposite of what the method name says. To get the expected result, you can remove the comment on the line with joinPoint.proceed() and remove the line below. Eventually remove the AspectJ compiler or the JVM agent to avoid weaving in the advice. Features like transaction handling, security and concurrency support are good candidates to be done with aspects. Spring, Guice and EJB implementations all use aspects to provide such enterprise capabilities without cluttering the application’s source code with infrastructure logic. You can see this post for a good example. Best practice with Java 5 and later is to add an annotation on methods that will be intercepted. These annotations are excellent pointcuts for enterprise frameworks. To change the target method like the StringAspect above should be avoided. You can replace an instance with a mock/stub object with AspectJ. In situations where the called instance is an object of a final class that doesn’t implement any interfaces, then an aspect is your only choice. It mocks away the dependency, but refactoring the code and use a mocking framework should be the preferred choice. It makes the code much more readable. Especially without a tool like AJDT that visualizes the joinpoints in the source code. Here’s an example with the AJDT Eclipse plugin. You should be really careful about adding or changing any data inside an advice. Such modifications makes the code almost impossible to read and the chance for bugs are higher. Else, if many of the developers in a team isn’t familiar with aspects, you should also limit the use since it adds “magic” to the application that only a few developers on the team can understand. The goal with this tutorial is to explain how you can add enterprise functionality declaratively and how an application container does it. Enterprise functionality like transaction handling and security are often handled by an application container. I will demonstrate how to add transactional handling with the Decorator pattern, an interceptor (AspectJ) and an interceptor configured with the Spring framework. All the alternatives works without adding boilerplate transaction logic to the business classes. The decorator pattern can add behaviour to your business implementation without polluting the business implementation. The limitation with the decorator pattern compared to an interceptor is that the decorator must implement your business class’ interface. An interceptor implemented with the AspectJ technology modifies the class either at compile or load-time. A general practice is to add business functionality with decorators, while you add enterprise functionality like transaction handling and security logic with interceptors. This tutorial consist of four examples all using the interfaces on the image below with transaction logic around the transferAmount(..) method. The sequence diagram illustrates a successful transaction that will be commited. The other case demonstrated is when the credit method fails. Then the amount transferred from the debit account must be cancelled with a roll back. The roll back is triggered with a RuntimeException. This is the default way with EJB as well as the lightweight containers like Spring and Google Juice. All the examples except the last one uses stub implementations for the repository and the transaction logic. The last example with Spring uses an embedded database and a JDBC transaction manager. This decorator example consist of the interfaces on the sequence diagram above as well as implementations of them and a transaction decorator that also implements the AccountService. The method doesn’t contain any transactional logic. Since this example doesn’t use any interceptors, the @Transactional annotation is ignored. The decorator must implement the business interface like the business implementation above. Then it must have a reference to the interface. This enables the decorator to call the next decorator/service recursively. The decorator doesn’t know if the reference to the interface is to the implementation or to another decorator. Only the factory method knows that. This enables loose coupling and the ability to add behaviour to your service with only a configuration change. The decorator adds behaviour before and after the service is executed. And if a RuntimeException is throwed back, it will be catched and a roll back will be simulated. With normal execution, the decorator will simulate a commit like you can see in the log message above. An implementation that uses the decorator pattern, should also use the factory pattern. In this example the factory logic is in the constructor of the test class. The important part in this factory method is that the accountService instance points to the transaction decorator object. And that the transaction decorator is instantiated with a reference to the business implementation. If the accountService instance had pointed to the business implementation instead of the decorator, then no transaction logic would have been executed. The last part of this decorator example is the JUnit test. As you can see from the highlighted code, the test doesn’t know about the implementation or any decorators. It just executes the transferAmount() method on the accountService instance. And this instance is declared to be of the interface type. Spring Aspects supports Spring AOP (Dynamic Objects and CGLIB) and AspectJ. Both alternatives support the AspectJ syntax. AspectJ is more powerful while Spring AOP is easier to use together with the Spring container. In this interceptor example I will use AspectJ. This is because it also works without the Spring container. I’m using compile-time weaving for simplicity, since STS will do the weaving for me with the AJDT plugin and an AspectJ nature on the project. If you have enabled AspectJ nature on the Eclipse project, then you should see an orange arrow to the left of the transferAmount(..) method name. In the factory method in the JUnit test, the difference between this method and the decorator test is that the accountService instance doesn’t know about the aspect and the aspect doesn’t know about the AccountService implementation. In this case, the transaction logic will be weaved in at compile-time with the AspectJ compiler. With Spring it’s possible to add declarative transaction handling with Spring AOP and AspectJ. This example will use the default Spring AOP, since it’s the simplest and most used alternative. The default way to add transaction support with Spring and Java 5 or better is to annotate the transactional methods with @Transactional. This alternative requires the element in the configuration. It’s higlighted below. This element requires a transaction manager that implements Spring’s PlatformTransactionManager interface. The example uses just a stub implementation. The component-scan elements below finds all the Spring beans annotated with a specialization of the @Component annotation. The test below demonstrates how to instantiate the Spring container with annotations and how to inject Spring beans into class variables. Further it executes the transferAmount(..) method on the accountService instance. This instance is of AccountServiceImpl type because the component-scan element in the configuration found the @Service annotation above that class and the class implements the AccountService interface. It doesn’t know about any aspects. And in this case with Spring AOP, the transaction logic will be added at runtime. No extra compiler or JVM agent is required. In all the examples so far in this tutorial, I have used stub implementations for the transaction handling and only simulated a repository with another stub. In this last example, I will use plain JDBC against HSQL database and a DataSourceTransactionManager. Second, the configuration must contain a DataSourceTransactionManager, a data source and the AccountRepository implementation above. The Decorator pattern and aspect technologies enables enterprise functionality without an application container and boilerplate code in your business logic.The simplest solution if you’re already are familiar with an application container is to delegate the enterprise functionality to the container like the last two examples in this tutorial. This cheat sheet uses AspectJ’s @AspectJ style. It’s also possible to use the original AspectJ syntax like this example demonstrates, but I prefer to use standard Java classes with the AspectJ logic inside annotations. A pointcut is a program element that picks out join points and exposes data from the execution context of those join points. Pointcuts are used primarily by advice. They can be composed with boolean operators to build up other pointcuts. call – The pointcut will find all methods that calls a method in the demo package. execution – The pointcut will find all methods in the demo package. withincode – All the statements inside the methods in the demo package. within – all statements inside the a class that ends with Test. get – all reads to jdbcTemplate fields of type JdbcTemplate in the integration.db package. Includes all methods on this field if it’s an object. set – when you set the jdbcTemplate field of type JdbcTemplate in the integration.db package to a new value. This chapter explains more advanced signature pointcuts than illustrated on the image above. Note that the pointcut also contains args(coffeeTypeName) and that the Java method has a method with a CoffeeTypeName as input parameter. An advice that advices this pointcut must also have this input parameter. This field pointcut finds all the places in the integration package where a field named jdbcTemplate gets a new value of type JdbcOperations or a subtype of it like JdbTemplate. A pointcut can declare an annotation before the signature pattern. All it does is to provide meta information to methods. The @Transactional annotation supports both method and type target. Which means it can be used with both method and type designators. The pointcut below is the same as the performanceLogableMethod pointcut, except it finds methods with Spring’s @Transactional annotation. The @Service annotation has target set to type and can therefore only annotate types. The pointcut below will find all statements in all types marked with @Service. For a full example with explanations, see this post. Instead of having a large pointcut, it’s a much better approach to combine several pointcuts into one. A piece of advice brings together a pointcut and a body of code to define aspect implementation that runs at join points picked out by the pointcut. An advice can be executed before, after, after returning, after throwing or around the joinpoint. This after advice is executed after the target method. The AfterReturning advice will only be executed if the adviced method returns successfully. The around advice is quite powerful, but also consumes more resources and should only be used if you can’t make it work with other advices. The example below simulates some logic before and after the adviced method. The ProceedingJoinPoint extends the JoinPoint class and is required to call the adviced method with the proceed() method. Note: You don’t need an around advice to monitor the execution time for a method. It’s just the simplest option and therefore used in this example. The advice below combines two pointcuts and the last one has an integer object as input parameter. This requires the Java method to also have an integer parameter. It enables the advice logic to access the input parameter directly and in a type safe manner. A less elegant alternative is to access the parameter with the joinPoint’s getArgs() method. This cheat sheet consist of many simple pointcuts. Often you have to combine them to add value to your application. This example article combines pointcuts with a class marked with @Service and a constructor and method marked with @Inject. It also filters away the test method with the @Test annotation. The code used in this article was developed in my work time at Redpill Linpro. This example demonstrates how to trace methods, constructors and fields annotated with @Inject and that’s inside a class annotated with @Component or a specialization of it like @Service. The aspect has three advices that combines different pointcuts. All the pointcuts uses primary marker interfaces (annotations) to determine where to place the adviced code. The annotations used in the pointcuts have target set to either method or type. The example consist of a Demo class, a TraceAspect, a Spring configuration file and a JUnit test. The test starts the Spring container and the container injects all fields, methods and constructors in the Demo and DemoTest classes annotated with @Inject. It’s this dependency injection that the aspect will monitor and trace. The last part is when the test method calls the toString() method on the demo object and the toString() method reads the value in the text field. This get operation on the field is also monitored and traced by the aspect. The Demo class has a text field that’s impossible to advice when the field gets set, since the Spring container injects the value with reflection and it’s no places in the code that sets this field. But it’s possible to advice the toString() method that reads this field. The constructor and method annotated with @Inject are adviced after they have returned successfully. The first two orange arrows shows the joinpoint for two afterReturn advices, while the last one show the joinpoint for an around advice. Briefly summarized, the aspect below traces all methods and constructors in the demo package annotated with @Inject and that’s inside a type annotated with @Component or a specialization of it. Further, it demonstrates how to declare a pointcut with or without @args(..). The last advice is an around advice that traces all String fields annotated with @Inject in the demo package. It also prints out the return value. * types and how to advice those aspects. // Using joinPoint.getArgs() to show arguments. System.out.print("Executed the @Injected method: "
System.out.println("Get on @Inject String field: "
The configuration file below contains a component-scan element that finds the Demo class because it’s annotated with @Service. The three other beans are injected into the demo bean’s field, constructor and method marked with @Inject. This is enabled with the component-scan or annotation-config element in the context namespace. Since it’s two integers, the method and constructor in the Demo class also have an @Named(..) annotation with a value equal to the bean id that’s injected. 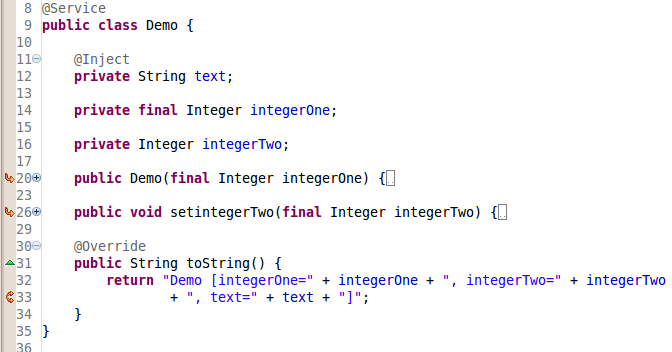 Finally, the test class that instantiates the Spring container executes the toString() method on the demo object. If you’re not familiar with Spring, you can replace the Spring configuration with a factory method in the test class instead as long as you’re setting the @Inject field, constructor and method. Annotations are very good pointcuts and are frequently used by application containers to add enterprise features. See also this cheat sheet for more information about how to write aspects with @AspectJ style. The tcServer developer edition is a Tomcat server with monitor support. The monitor support is provided through a tcServer template called Spring insight. The template is a web application. The monitor data from your application are gathered with AspectJ load-time weaving, stored in memory and presented on the Spring insight web site deployed on the tcServer developer edition server. For local monitoring, you can find the insight application here: http://localhost:8080/insight. The screenshot shows all the recent traffic to the demo application’s servlets. A click on one of the bars gives you access to detailed information about the requests processed in that time period. The other view is application health. The screenshot below shows the application health for the “findBalance” web service. The service monitored above behave quite well and Spring insight claims its health is excellent. The example is from a web service and shows which parameters and return types my monitored beans are invoked with. Almost all the execution time for this request was used in the repository and you can see that the repository throwed an exception back. You can even read the exception message. If you’re using the WEB browser inside Spring Tool Suite (STS), you can also jump directly into the source code through the “Go to STS” link. For a full introduction into monitoring with tcServer and Spring insight, you should see this presentation. It shows that you can see all the SQLs sent to the database and all the HTTP request and response messages handled by your application’s servlets. The Spring insight application uses load-time weaving to monitor your application. Out of the box, Spring insight monitors the SQLs and HTTP request/response messages. To monitor your own classes, you have to add an @Component annotation above your class or preferably a specification like @Controller, @Service or @Repository. For Spring insight, these annotations are just marker annotations that tells AspectJ which classes to weave. These annotations can also be used to define your Spring beans with component scanning. But it’s not related to the way Spring insight uses them since Spring insight uses them at load-time, which is before the Spring container is started (runtime). The screenshot below shows a server that increases the load with ten clients every fifth second. In the beginning, the throughput increases with a low increase in response time. With more clients the throughput still improves, but the average response time increases much more. The last image shows the same application with the number of clients doubled every fifth second. After a while it results in bad and unstable response time. The graph isn’t 100% correct since I run the clients on the same machine as the server. But the tests indicates quite clear that this application shouldn’t have unlimited number of server threads. You can see the response time is very unstable and Spring insight claims the application has bad health. With less server threads the application health improves. The tcServer developer edition is an excellent choice for monitoring web applications that can run on Tomcat. With an annotation over all the classes you’re interested in monitoring, you get access to detailed information like execution time, parameters, exceptions and return types. And you’re only a click away from inspecting the code you find something interesting. Spring 3 supports declarative concurrency support. At its simplest, you only need to specify in the Spring configuration file and add an @Async annotation above the method that you want to execute in an asynchronous process. See also this blog for step by step guide on how to execute a void method asynchronously. If the method that’s executed asynchronously throws an exception, it will be wrapped inside an ExecutionException and throwed when the Future’s get method gets called. If you prefer to use the Java EE 6 specification, then you can replace Spring’s Async and AsyncResult classes with the corresponding classes in the javax.ejb package in the commons annotations 1.1 specification. The Spring container understand the javax.ejb classes without any configuration changes. You only need to add the commons annotation API on the classpath. Spring’s asynchronous support abstracts away most of the complex threading logic for you and still provides full access to the implementation behind. It also supports the new async API in Java EE 6 without any configuration changes.